I was born in Larnaca, Cyprus where I have finished High School in 1981. All my life I have owned dogs. I had my first German Shepherd in the late 1980s and became a member of the SV-Germany “Verein fuer Deutsche Schaeferhunde” and a Member of the Cyprus Kennel Club the same time. I own and breed German Shepherds and German Shorthair Pointers. I am owner of the FCI-Kennel “House Scala”. 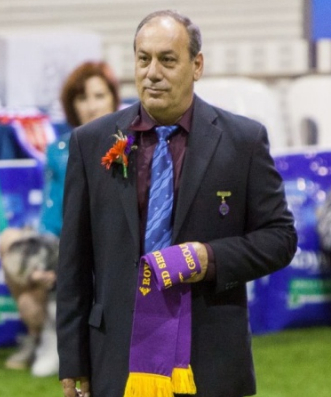 Also I am breeding inspector for the district Larnaca, and I have been in various positions in the German Shepherd Club of Cyprus, as well as president of the Disciplinary Committee of the Cyprus Kennel Club. As a judge I had until now the pleasure to judge at shows in Australia, the Philippines, Taiwan, Russia, Ukraine, Greece, France, Romania and other European Countries. As FCI Judge I am licensed for the FCI groups 1,2,3,4,5,6,7,8,9, 10 on CAC level and 1,2,3,4,5,6,7, 8 on CACIB level with speciality all of Group 1, and all of Group 7.